Sentosa, Singapore, January 16: Thailand’s Jazz Janewattananond is ready to capitalise on his good form and become the third Thai to lift the prestigious SMBC Singapore Open trophy when the US$1 million event starts on Thursday. The 23-year-old arrived in the Lion City on the back of a rich vein of form, having started the year with a fifth-place finish on home soil. He also finished second at the Asian Tour season-ending event in Jakarta barely a month ago. Jazz is hoping to follow the footsteps of Thaworn Wiratchant and Prayad Marksaeng who inked their names into the illustrious roll of honour when they won the Singapore Open in 2001 and 2017 respectively. Jazz’s strong performance at the Serapong Course, Sentosa Golf Club where he finished tied-fourth last year, earning himself a dream ticket to The Open has fuelled his belief that he can do well again this week. South Africa’s Justin Harding, who announced his arrival in Asia by winning his maiden Asian Tour title in what was only his first start in Indonesia last year, is feeling refreshed and ready for the brand new season ahead. Following his breakthrough in Indonesia, Harding went on to clinch another back-to-back title in Thailand in his next event before going on to enjoy four other top-10s to finish third on the Order of Merit. Korea’s Sanghyun Park is also chasing his third but first Asian Tour victory outside his native country. Park enjoyed one of his best results in Singapore when he finished tied for sixth at the SMBC Singapore Open in 2017. Jazz Janewattananond first played his way into the history books of the Asian Tour in 2010 when he became the youngest ever player to make the halfway cut at the 2010 Asian Tour International in Bangkok at the age of 14 years and 71 days. He won his first Asian Tour title at the 2017 Bashundhara Bangladesh Open and claimed his second win at the Queen’s Cup on home soil in June. Jazz’s breakthrough victory in Bangladesh was especially sweet as he had finished outside the top-60 on the 2016 Order of Merit and missed the grade at the 2017 Qualifying School. Justin Harding won his first Asian Tour title in his first start on the 2018 Asian Tour season with his win in Indonesia in July last year. He immediately took up the Tour membership after his victory. Harding later claimed a six-shot victory in Thailand to become the first player since 2011 to win back-to-back titles on the Asian Tour. The South African ended his 2018 Asian Tour season in third place on the Order of Merit. Harding is making his debut appearance at the SMBC Singapore Open this week. It is also his maiden trip to Singapore. Park has been victorious at the two Asian Tour events in Korea this year. He won the GS Caltex Maekyung Open in May and was outstanding again at the 34th Shinhan Donghae Open in September last year. The Korean reached a career-high of 116th on the Official World Golf Ranking (OWGR) in September and finished in second place on the Asian Tour Order of Merit last year. 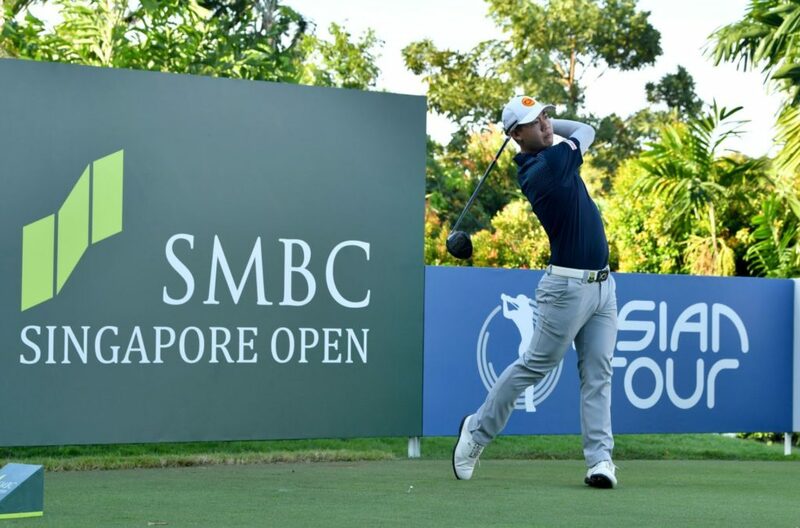 The SMBC Singapore Open continues to be part of The Open Qualifying Series for the third consecutive year with the leading four players (not otherwise exempt) who finish in the top 12 and ties earning their places at the 148th Open in July. I love coming back to Singapore. I played really well at the Sentosa Golf Club the last two years. The course is in great shape and my game is quite good. I had two weeks off before playing last week. It’s a good feeling to have at the start of the year. I played well last year to earn my Major debut. I would love to do it again. I really enjoyed myself at The Open last year and it’s definitely my aim to go to Royal Portrush this July. It was an eye-opener for me at The Open and it’s one of the best experiences which I have ever had. The 2018 season only ended like two weeks ago for me. I didn’t get a lot of rest but it’s ok. Sometimes it’s not good to take a long break. You need a lot of time to find back your form. Two to three weeks will be perfect. My aim is to get multiple wins on the Asian Tour this year. I have been wanting to achieve that for a few years now. I planned to play more in Europe as well. I would love to have more of 2018 actually. The past seven months have obviously been a whirlwind, especially since my breakthrough in Indonesia. It’s just going to be pretty much the same. I am playing the Serapong course for the first time this week and it’s the start of a brand-new Asian Tour season. The course’s certainly not easy. It’s demanding off the tee. It’s my first time in Singapore. It’s bit tricky when you can’t explain every time you travel to a new place and people back home thinks you’re going on a holiday. Very often, it’s just travelling between golf course and hotel for me. I flew in here on Saturday. I would love to tour around Singapore a little but I only had the chance to tour the island. The atmosphere is good here. At the end of the day, it’s about playing in this tournament. It’s the first of the season. It’s nice coming off a good break and start the season here. It’s like a warm-up to the season this week but the golf course is a great test to every aspects of your game. You kind of need to come in early and prepare well and be all ready for tomorrow. I had a great year last year. I am delighted to be back. I think the more I play here, the more I am familiar with this course. Hopefully my experiences from the past two years will help me this week. I played in The Open for the first-time last year too. I missed out on the opportunity in Singapore when I finished tied-sixth but made up for the disappointment by securing my spot through the Kolon Korean Open later. It was a pity that I didn’t play well in Carnoustie. I would love to play The Open again this year. Golf in India ‘www.golfinindia.xyz’ is an Online Information & ensuing business website almost for every requirement, everyone can look to source reliable companies from different business verticals of Golf Industry. It has the listings of trusted, credible and reliable manufacturers, importers, traders and service providers, which will help prospective golf decision makers to consider GII as a platform for golf in India.